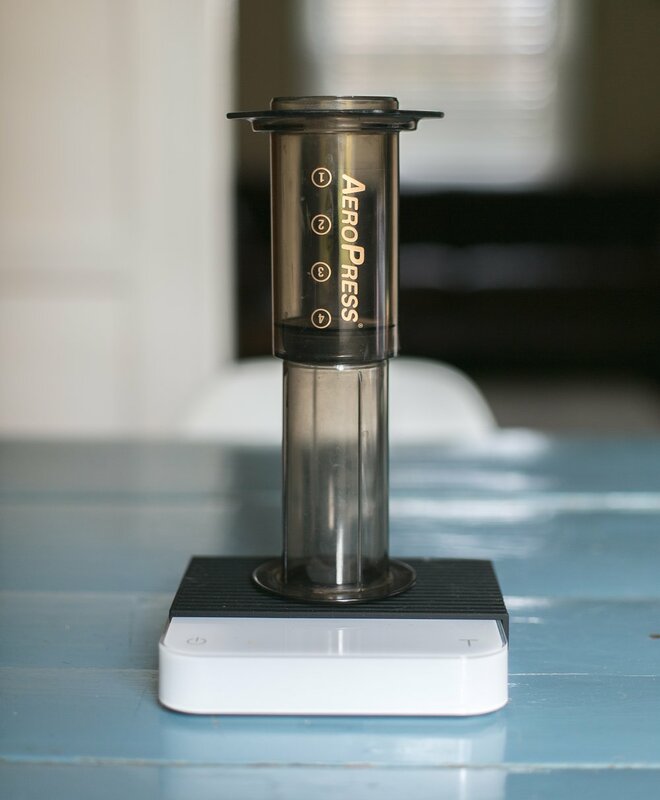 aeropress — Greenberry's Coffee Co. Awesome portable brewing method that yields a quick, delicious single cup of coffee. The Aeropress was invented by the same engineer that invented the Aerobie Frisbee; Alan Adler. We love the Aeropress for it's ability to use while out adventuring without having to pack a ton of extra gear. Not to mention it makes one great cup of coffee. Enjoy! Weigh out 18 grams of coffee, which will be about one rounded Aeropress Scoop. Grind the coffee on the finer side, close to table salt texture. For this recipe we'll be using around 200g of water, bring to a boil. You have two options for filters, a paper filter and a stainless steel mesh filter. The steel mesh filter is greatfor the Eco-conscious. If you're going with the paper filters, make sure you place them in the Aeropress cap and use your hot water to give them a quick rinse. Assemble the Aeropress with the plunger at the bottom. This is known as the "inverted" method, some prefer this method as it ensures complete saturation of the coffee grounds. Pull the plunger out to just above the 4 mark on the Aeropress and make sure the seal is tight. Add your ground coffee to the Aeropress. Once you remove your kettle from boil wait about 30 seconds and it will be in the 200-205 degree temp range. Now carefully fill the Aeropess to the top, making sure to leave space for the bloom. Let the coffee grounds steep for 1-minute then give them a quick stir. I use the end of the Aeropress spoon but any stirrer will suffice. Make sure the Aeropress cap still has the filter in it and securely screw it on top. Carefully flip the Aeropress over onto your mug and slowly press the plunger down. This process should take about 60-70 seconds and once you hear the hissing sound you'll know you're done with the brew. Enjoy! For quick clean-up remove the cap and finish pushing the spent grounds all the way out into the trash or your garden!